Some days though, it feels like a dark cloud looming over my head. Some days I DON’T feel like being a Proverbs 31 woman. Ok, you can pick yourself up out of the floor now. 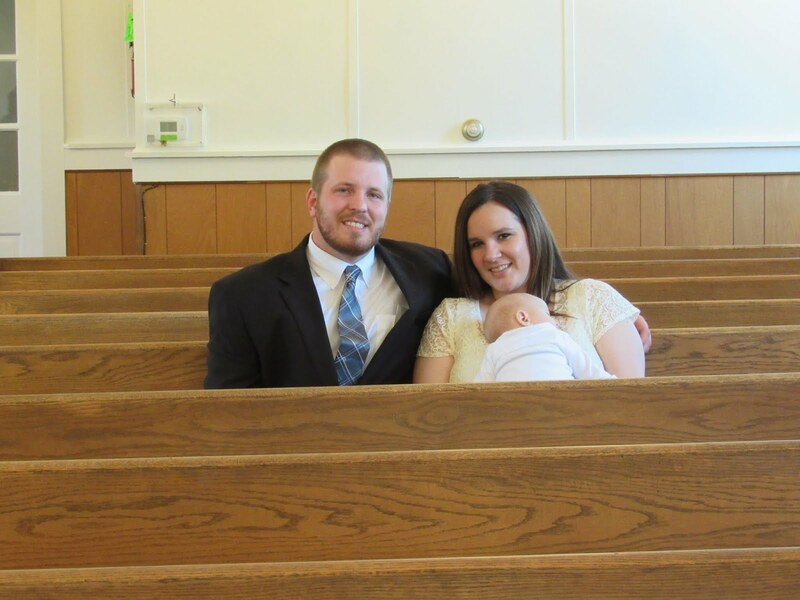 Yes, I am a Pastor’s wife and I am proud of that. I love the Lord with all that I am. I love my husband and son with all of my heart. Some days though, I just don’t feel like being a Proverbs 31 woman. Some days, I’m grouchy or snippy. Some days, I don’t ‘rise while it is yet night’…some days, I sleep while the baby sleeps. Some days I don’t feel like being kind to my husband, maybe because he was short with me or maybe for no reason at all. Some days I don’t feel like opening my hands to the poor…instead I would rather take that money and go get a pedicure. Some days I say dumb things. When I open my mouth, the last thing that comes out is wisdom. Some days I suggest we go out to dinner because I just don’t feel like cooking. 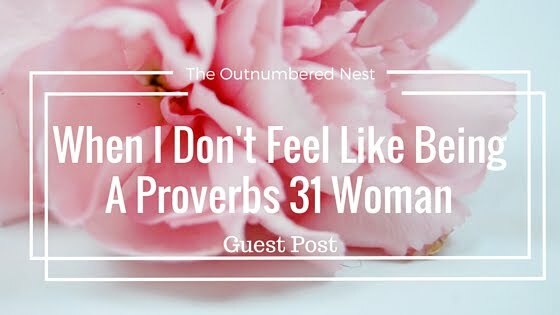 You get the point….some days, I just don’t feel like being a Proverbs 31 woman! Don’t we all though? I think we would be lying to say that we didn’t all feel this way from time to time. There was only one perfect One to ever walk this planet, and it sure wasn’t me! Proverbs 31 is one of the most famously quoted pieces of Scripture pertaining to women. I think as wives and moms, we can be really hard on ourselves. Proverbs 31 is a very high standard to live up to, but it is one that I strive to model my character and life after. The good news is, there is more to the story than just this piece of Scripture. There is grace…and a whole lot of it. His power is made PERFECT in weakness. Perfect is a word that I would never use to describe myself, but to think that His power is made PERFECT in our weakness? Amazing. When I fail at being a Proverbs 31 woman, His grace is sufficient for me. This verse even goes a step further…we are told to BOAST in our weaknesses so that the power of Christ may rest upon us. I’m not one to brag or boast, but to boast in the fact that sometimes I just don’t feel like being a Proverbs 31 woman, because I am weak…wow. So today, friend, I hope that you chose to boast in your weaknesses. Not wallow, not continue in sin, but give your weakness to Him. Understand that sleeping when the baby sleeps is ok, because momma…you put that baby to sleep. Understand that He can give us strength to be kind, even when we don’t feel like it, or the other party doesn’t deserve it. Understand that because you say dumb things or chose unkind words, that you are so loved, by Someone who died for you. We can ask for forgiveness. Understand that even though you didn’t cook dinner, your family is taken care of. Maybe you caught up on laundry, maybe you spent the day holding a sick child, maybe you worked 60 hours that week. Understand that His grace IS sufficient. While we should try to model our character after His Word, some days we will fail. We don’t stay there though, we persevere and cling tightly to that grace. Love this post, and definitely needed to hear it today! Thank you, DeAnna and Allison for allowing God to use you in blogging! I think you are 100% right, it is often overlooked that it is a perception instead of her own words. In her mind, she may not be anything "special" and could have felt the way many of us mothers and wife's do! Often people tell me how great of a mom I am, when I feel like I'm barely hanging on. Thank you for the comment! This was very uplifting to read! As a tired and worn out mama, I don't feel so excellent. :-( Most of the time, I just feel like surviving! Thankfully, when I feel this inadequate, I know that God completes me and sees the work that I'm doing. The quality of our work isn't necessarily a reflection of our heart. I am about 98% positive that all mama's feel like they are barely surviving. I know that I do! Seriously, there are some days where I just think, "Lord. Are You Sure That I Was The Best Option To Be Their Mother?" but in the end I was. My kids are happy and healthy, and I'm sure yours are too! God understands how hard we try. Also as someone above mentioned, this is but a perception of this women- for all we know she could have been a worn out, barely surviving mama in her own mind too. We let guilt steal so much of our joy. God gives us wisdom and while we can make whatever choice we need to, we also need to listen to our inner voice, listen when God wants us to rest. Don't let guilt steal your joy of resting with the baby. Soon they will be out slaying dragons and demons while you watch from a distance. Marie, you are so right. My "little" boy turns 5 this month, and his brother is quickly approaching two. I remember when they first were born, and I can't believe how fast time has flown. He already shows so much independent that I think, one day he won't need me. Then he will come up and hug me, making sure I know that he'll always need some "momma love". Amen even n our weakness we can still honor God through it and witness to those around us. "For when we are weak he is strong"
Amen! Let's give ourselves grace ladies.